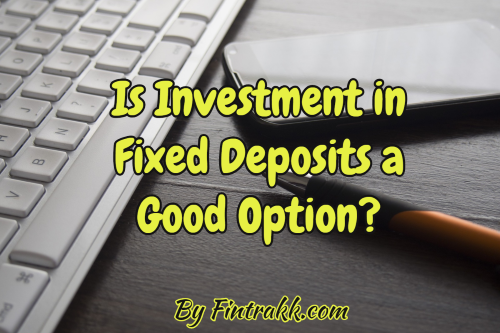 Is Investment in Fixed Deposits a Good option? Fixed Deposits or their close cousin RD’s (Recurring deposits) are the most popular saving instrument in India. According to RBI, Indians invested approximately Rs 6800 Billion in fixed or bank deposits that means more than 55 % household savings are invested in Bank deposits. While Fixed deposits or FDs are popular because of the risk-free nature of this asset and relative ease of investing and managing. However, if you have huge expectations from your FD investing strategy, they might not prove to be the best investment instruments to grow your money. Next time you hear that an FD has got a return of 8%. You need to take it with a pinch of salt. Fixed deposits attract TDS so the actual return after tax will be much lesser than the sticker return. You can calculate post-tax returns in a simple way see one example below. Say, you have an FD of Rs. 10000 at 8% interest p.a. Now, does that mean you will get Rs. 800 interest? No, you will actually get a lesser amount. With a tax rate of 30 % , you will only get Rs 560 , that means an annual return of 5.6 % only. Ok, lets put things in perspective, if you include tax into calculations your FD return will be reduced by your tax rate so, for people in 30 % bracket, it will be reduced by the same. ALSO READ Q.What are other short term investment options other than FDs ? *Please note that we have rounded off Tax rates so returns shown might vary from actual returns. After taxes, what can hurt any investor is inflation. Before we explain how, let’s look at the average CPI-based inflation in India in the past few years. If you look at the table above Consumer inflation in India has been hovering around 6% . So any asset class whose post tax return is 6 % or less, is actually reducing your wealth. If your FD is giving a return of 8% and you are in the 30 % tax bracket. Your post-tax return is 5.6 % only. Now, if inflation is 6 %, then your wealth or savings are going to erode approximately at the rate of 0.4 % per annum. In short with inflation hovering around 5.5- 6% most of the FDs shall give negative rate of return. Fixed deposits are supposed to be liquid means. You can withdraw money at any time at a short notice. But, most of the time this liquidity comes at a cost. Most big banks charge a penalty of 0.5-1 % for premature withdrawal. One tip to overcome this is to create multiple small FDs rather than one single FD. One more crucial point to note with FD investment is that tax deduction happens at source unlike some debt mutual funds, where you can defer taxes. Hence, your capital can grow much faster through other long term investment alternatives. Taking the example we used in point 2, if you have an FD for Rs.10,000 and your interest rate is 8% p.a. You earned Rs. 800 as interest, now post deduction your interest is Rs 560 only. Hence, your new principal is Rs.10560. As a result, you have a lower base to grow. In case of debt mutual funds, you can keep on deferring tax till you withdraw and hence your money can grow at a faster pace. You can easily replace your FD portfolio by investing in short-term debt instruments and liquid funds, to get additional 1-2 % of returns. Liquid funds invest in short-term securities with maturities less than 91 days. Depending on the fund investments can be in government securities or short-term corporate bonds. Short term debt funds also invest in mix of g-secs and SCB’s but with a maturity of 91-180 days. While Fixed Deposits have been a traditional and a very popular saving instrument for individual investors in India. FDs are still regarded as the safest investment option for risk averse investors. So, if you are satisfied with fixed returns without taking any risk, investing in FD might be a good fit for you. ALSO READ Mutual Funds Ratings: Are they best way to build Your Investment Portfolio? But, if you wish to expand your risk horizon and look beyond FD investing, you can get to explore a whole lot of investment alternatives to diversify your portfolio. How do you invest your money? Do you prefer fixed income instruments like Fixed deposits or you look forward to trying other emerging investment options also? Feel free to share your feedback and experiences thereon.